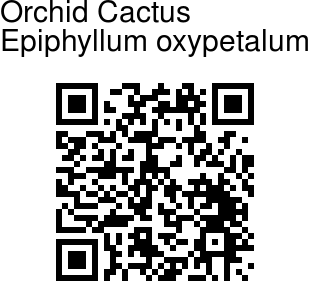 Orchid cactus blooms at night, since the flowers are predominantly pollinated by bats and large moths. 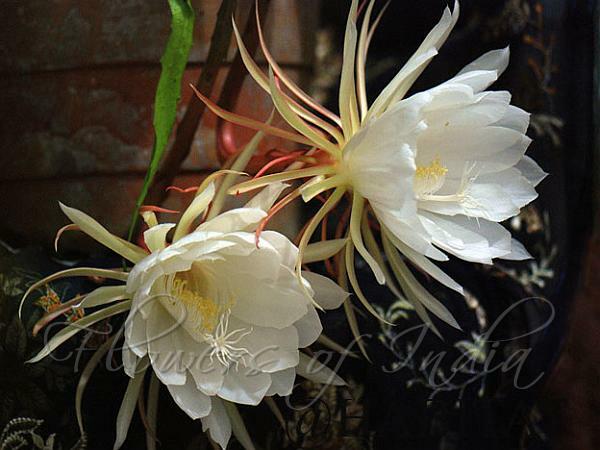 They have large white star-like flowers to help their pollinators locate the blossoms by moon or star light, and many have very lovely fragrances. Pure white flowers, the size of a dinner plate, open as soon as the sun goes down and stay open all night, closing in the morning. It is a shrub growing on trees, freely branched, 2-6 m tall, with aerial roots. Old stems and basal extension shoots round, to 2 m or more, woody; branches numerous, dark green, laterally flattened, leaflike, lanceshaped to oblong-lanceshaped, 15-100 × 5-12 cm, hairless, base wedge-shaped, narrowed, or stalked, margin wavy to deeply rounded toothed, tip pointed to tapering; midrib 2-6 mm wide, stout. Areoles small, spineless. Flowers nocturnal, fragrant, funnel-shaped, 25-30 × 10-27 cm. Receptacle tube 13-18 cm, base green, 4-9 mm in diameter, slightly angled, with triangular to lanceshaped scales 3-10 mm. Sepaloids often recurved, pale green or pinkish red, linear to inverted-lanceshaped. Petaloids white, inverted-lanceshaped to obovate, 7-10 × 3-4.5 cm. Filaments white, 2.5-5 mm; anthers cream, 3-3.5 mm. Style white, 20-22 cm; stigmas 15-20, cream, narrowly linear, 1.6-1.8 mm. Fruit rare, purplish red, oblong, about 16 × 5.7 cm. Seed 2-2.5 × about 1.5 mm. Fl. Jun-Oct.